Generally the softer the rubber compound the greater the friction. Standard servo wheels generally come with rubber band tyres, low cost wheels often have 'O' Ring tyres and Tamiya wheel have their own molded tyres. Low Cost and Servo wheels lend themselves to various rubber bands and 'O' rings as well as foam rubbers. 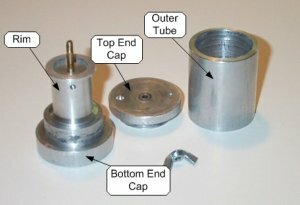 Other techniques can be used to get better compounds, Dave Hylands had recorded how he made Marauder's Tyres molding onto standard servo wheels. Molded wheels take a bit more work but with custom wheels you have a much wider variety of compounds that can be used on the tyres. This example comes from Blade Runner built by Phil Davis, more about this 'bot and it's molded wheels can be found in Nuts & Volts Jul/Aug 2006. To the right we can see the wheel hub/rim before and after casting. In this mold the wheel rim is dropped over a location pin mounted in to the bottom end cap. The outer tube is slipped over prior to fitting the top end cap. 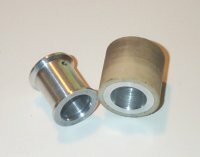 With two holes in the end cap we can pour freely through one as air escapes through the other. The tyre is formed in the space between the outer tube and rim. Phil used a Soft Por-A-Mold Kit DickBlick.com to cast his wheels and Synlube 531, a wax based mold release agent, on the inside of the tube to help separate the tyre from mold. It took around 6 hours for the rubber to set and a feeler guage was used to help with the mechanical separation. A syringe, without needle, was used to measure and to inject the rubber compound. 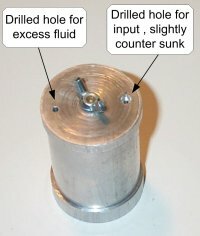 The countersunk hole helped locate the syringe. There are a number of suppliers in the UK selling material silicone rubber suitable for casting tyres, such as Trylon and W.P. Notcutt Ltd but there are many more on the 'net if you look. Where the harness if the rubber Shore A is 10 or less you will see the co-efficent of friction, between tyre and dohyo, rising to 1 or more. At this point a 'bot with enough torque can push more than it's own weight. Get a very accurate set of scales. Most of the casting rubbers I've used are mixed by weight. It can be quite critical & you will only be using small quantities. Bob Cook has put together an excellent photo turorial on step by step machining for this type wheel. The pages start here but you'll see a process summary in pictures here, it's well worth a look. If your buying and using engineering material it's relatively easy to make a judgement, based on hardness, about which material is going to give the better grip. It is common to see hardness defined in the Shore scale, the higher the number the harder the material. Shore A measures flexible rubbers and Shore D is used for rigid types, but the ranges do overlap. If, like James and Phil, you use a molding material the bottom line when assessing material is testing. As discussed in the friction theory surface are doesn't make a difference, mass does. Make the mass as large as practical on you test pieces, and make sure it's equal for all materials tested. Pull against a spring ballance and you'll soon see which materal gives the sticky results. This test works equally well for odd sample materials and 'bot based tests, regardless of your knowledge on the material hardness. Using the pull test we calculated the co-efficent of friction for our Tamiya Tyres as 0.84, Servo Tyres as 0.63 - 0.75 and 'O' ring tyres as 0.67, some variation on the servo tryes may have arisen from the crudness of the testing. Different 'O' ring compounds may give different results, while the servo band tyres preformed better in this test it may not always be the case. Similarly 'O' rings may match or beat the Tamiya tyres. You'll find related Mechanial discussion in the MiniSumo Forum, where we welcome your comments and feedback. Sumo Wheel and Mold Progress - From Tom_L's "Stealth"